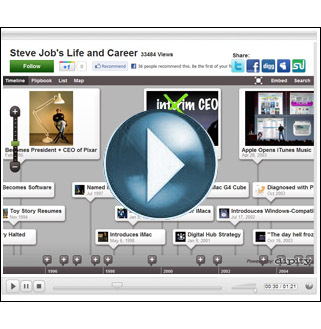 Quick overview: Dipity helps students to create interactive timelines comprised of significant events. Each “event” on the timeline can be fleshed out by the student to include text, images, and video. Timelines can be set private, public, or collaborative. How can it be used in the classroom: Instead of asking your students to memorize out-of-context historical dates, why not ask them to research and assemble their own interactive timeline instead? Furthermore, timelines need not be limited to events from ancient history. Instead, students could create a Dipity timeline that contains a breakdown of the various pieces leading up to a current event (i.e – political or economic situation) or they can even assemble a family history or bibliography. Here’s an example of a timeline created with Dipity. Is it free? Yes, the Dipity website allows for free accounts with most functionality intact. One limitation with free accounts is that you can only create three timeliness per account, with 150 events per timeline. Regardless, that shouldn’t be a problem for most student work. This entry was posted in Tools and Apps and tagged bibliography, dipity, history, interactive timeline, timeline, timelines. Bookmark the permalink.